16 Club champions competed in this year’s Champion of Champions hosted at Oxford City and County. Banbury Borough, Banbury Chestnuts, Blackbird Leys, Charlbury, Chipping Norton, Headington, Kidlington, Oxford City and County, Oxford University Press, South Oxford, Thame, Watlington, West Witney, Witney Mills, Witney Town and Woodstock were all represented for the one day that the competition came to its conclusion. After the morning’s rounds it was West Witney’s Paul Skidmore against Woodstock’s Brian Clarke and Chipping Norton’s Nigel Siford against South Oxford’s Keith Mobley left in the semi-finals fighting for a final place. After a very strong start from Woodstock’s Brian Clarke saw him 14 shots to 1 up against West Witney’s Paul Skidmore, he had to battle to save a quick exit. Skidmore did just this and brought the score right up to 20-19 and was holding game when Clarke played a fantastic trail on the jack with his last bowl to go from being game down to win the semi-final 21-19. The other semi-final saw Chipping Norton’s Nigel Siford against South Oxford’s Keith Mobley in a close match which saw Mobley take a 17-7 lead after 13 ends. 6 shots over the next 5 ends saw Siford fight back to 19-13 down before Mobley progressed to the final with 2 singles to win 21-19. The final between Brian Clarke and Keith Mobley was a close fought battle. There was never more than 4 shots between them taking the all the way to 18-14 in Clarke’s favour after 20 ends. Mobley picked up 2 singles to take the score to 18-16 before a fantastic end to see Mobley to take the lead 19-18 for the first time in the game. Mobley secured the double he needed on the next end to be crowned Champion of Champions to close out a fantastic season of competitive bowling. Thanks a due once again to Oxford City and County for providing excellent facilities and catering throughout the day, Lorraine behind the bar all day and a huge thank you to Alan Ley for organising markers for the day. Thank you to Alan Ley, Chris Lewis, Keith Croxon, Colin Pollard, Grahame Kerr, Ken Buckingham, Andrew Galloway, Karen Galloway, Steve Tolhurst and Bradley Squires for marking games throughout the day. Thanks are also due to Pete Davies who was the umpire for the day. Oxfordshire played Essex at Thame BC on Tuesday 19th September to play their final friendly of the 2017 season against Essex. The match was always close and at the end four rinks were within two shots. With 2 ending in ties the overall match swung on the last 2 ends on rink 4.Trailing by 1 Mike Andrew’s four picked up a 5 on end 20 to raise hopes of a narrow Oxfordshire win. However a dropped 5 on the final end crushed such hopes. It was left to Paul Robbins’ four on the show rink to pick up 6 shots to produce a match draw but that proved too much and they produced a single shot.Jim Lucas played his 200th game for Oxfordshire and was presented with the appropriate badge by Deputy President Eddie Dorling. Terry Gripe Alan Wase Allan Hall Brian Bloomfield lost 12-14. 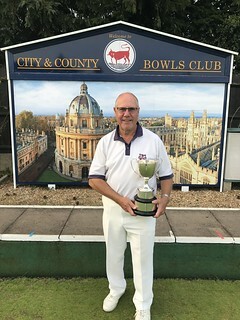 In the last domestic competition of the season, the 10 qualifying teams from across the County descended on Banbury Chestnuts for the Summertown Trophy final, sponsored by Oxford Auto Care. All teams playing each other over 7 ends in a round-robin format, to compete for over £1,000 in prize money. Watlington A and Banbury Borough B were the early pace setters, picking up some good wins in their first 4 games to lead the competition at lunch. After 7 matches hosts Banbury Chestnuts along with Headington B had climbed into contention on +19 shots, but still trailed both Banbury Borough and Watlington who were comfortably ahead. With just 2 games remaining, the heavens opened and the bowlers found themselves adjusting to the rainy conditions and a heavier green. Previous winners Banbury Borough and Headington then came face-to-face, with the Oxford side needing a good result to mount a late challenge. Headington adapted quickly to the wet weather and their 7 shot victory over Borough, now put them 2 shots ahead of their rivals. With both Watlington and Chestnuts suffering costly defeats, the competition had suddenly swung in favour of defending champions Headington B, with just 1 game remaining. By pure coincidence the final round saw Chris Gilkes’ Watlington rink come up against Mark Sykes’ four from the Borough, whilst Headington B faced Chestnuts. After 3 ends Watlington had edged back into pole position as they led the Borough, whilst there was little to choose between Headington v Chestnuts. On the penultimate end though, and with the scores still tight, Mark Charlett trailed the jack with his final wood to pick up a massive 7 shots for Headington. This late surge saw Headington B beat Chestnuts by 10 shots and recapture their title on +36 shots overall. 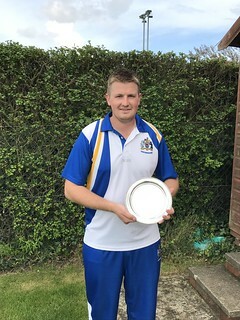 Watlington A defeated Banbury Borough by 4 shots in their last game to claim the runners-up prizes and the Astall Ley Trophy, also capping a fine season for the south Oxfordshire club. Whether you win use or draw, at least we all have the same after match meal. Unfortunately for the Past Presidents, playing their last game of the season, at Thame BC against Hertfordshire, the after match meal was the highlight of the afternoon and it was a meal well worth waiting for. One again the Thame club proved to be excellent hosts. The game itself went to Hertfordshire 116-83 as Oxfordshire took the hospitality bit a little too far losing on four of the five rinks. Out on the famed rink 6 with the swinging ditch hand, Alan Ley’s rink trailed 3-15 after twelve ends but then collected ten shots over the next three ends to bring themselves back into the game and although the last six ends were shared, they just missed out by one shot. Chairman Mike Andrew and his merry men were even more generous, waiting until the twelfth end before recording a score to leave them only seventeen shots beind their opponents. A flurry of shots between the sixteenth and nineteenth ends made the scoreline look a little more respectable but they have given the Herts lads too good a start. Melvin Brain’s foursome were only three shots adrift at fourteen but only managed to score on one more end as they ran out 14-29 losers. Whoever kept the scorecard on this rink had a very creative scoring technique. John McGeough’s card keeper also tried a new method of staying close to their opponents by actually detracting shots scored by the opposition on the last two ends of their game. Sorry boy’s, it was noticed and you lost by 9. 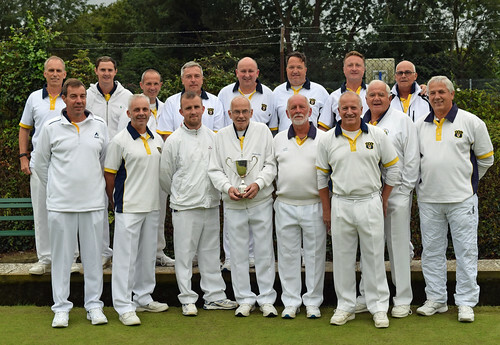 Oxfordshire’s only ray of sunshine was provided by Ian Whelpton’s four in their seesaw match. Having dropped seven shots on the first two ends they took the next five to lead by 5, only to then lose the next four to go 3 down. The following four ends put them back in the lead by four shots only for the Herts rink to collect the next two. Thankfully the last three ends went in Oxfordshire favour resulting in a 24-18 win. David Varney, Martin Oliver, Ken williams & Ian Whelpton 24-18. Francis Benham, John Timms, Alex Fleming & John McGeough 17-26. Bexhill BC was the choice venue for this year’s HCBA finals day, which provided excellent services throughout the day. After a very cold and early start, the Oxon pairing of Alistair Heyes and Will Parker were up against John and Jason Lyttle of Middlesex on the show rink of the four greens. The Oxon pair started well gaining a 5 shot to 2 lead after 4 ends before a 3 shot comeback from the Middlesex pair saw the score level at 5 ends. Good battling saw the Oxon pair 10-6 up at ten ends before a fantastic end saw a 5 shot pickup and a comfortable 15-6 lead. After 14 ends the Oxon boys were 20-8 up and looking promising before a late surge from the Lyttle pair see them gain 8 shots over the next three ends and reduce the deficit to 20-16 before the Oxon pair regained command in the game taking the score to 23-18 playing the last. A fantastic head was built by Heyes which left Parker smiling playing covering bowls to take the game 26-18 victors and progress to the pairs final. The other representative from Oxfordshire was Shane Cooper competing in the Under 25 Singles. He was up against Buckinghamshire’s representative, Jamie Seymour. A strong start from Bucks saw Seymour take an early 8-0 lead before Cooper battled back well to only be 1 shot down with the score at 10-9. Another surge from Seymour saw him in another comfortable position at 17-11. Good bowling from Cooper kept him in contention all the way through the game, battling once more to get the deficit back to 2 shots at 18-16. 2 Singles from Seymour saw him just needing 1 shot to progress to the final before 4 huge ends from Cooper leveling the game at 20 shots apiece. Nip and tuck bowling from both competitors saw Cooper take the game 21-20 victor, only being in front at the end of the game to win it! The HCBA under 25 singles final was between Oxfordshire’s Shane Cooper and Kent junior international Andy Rodger. Rodger took an early 10-3 lead and looked strong from the off. Confident bowling from Cooper was deserving of more shots than what actually prevailed seeing him 17 shots to 6 down after 15 ends. Unfortunately the difference proved too great for Cooper to recover from and he lost 21-8 to Rodger who was brilliant throughout. A tremendous effort from Shane Cooper has to be noted and credit must be given for his fantastic achievements this year, his final one as an Oxfordshire under 25 player. The HCBA pair’s final was between Oxfordshire’s Alistair Heyes and Will Parker against Buckinghamshire’s Malcolm Pratt and David Clay. A very even tussle from start to finish saw neither pair take a lead of more than 5 shots throughout the game. After 6 ends the Oxfordshire lads were 8-3 up and looking strong. A weak end on the 8th saw them drop a 6 shot count to see them 10-8 down. The next 7 ends saw fantastic bowling from both Heyes and Parker seeing them pick up 6 shots to Bucks’ 2. With the score at 14-12 in Oxfordshire’s favour, the Bucks skip played some world class bowls to pick up 6 shots over the next 5 ends to Oxfordshire’s 3 seeing the final end being played with Oxfordshire 18-17 down. Pratt’s fantastic last end put Parker under pressure and with his last bowl narrowly missing the target, saw Bucks win the Pairs title 21-17. 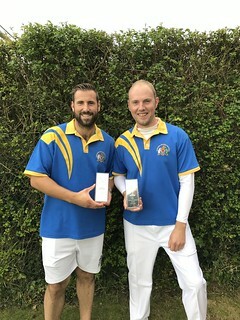 Once again a fantastic achievement from Alistair Heyes and Will Parker who were unlucky not to have claimed the title. The Oxfordshire Bowling Association wishes to thank Shane Cooper, Alistair Heyes, Will Parker and Bradley Squires for attending the day and driving the 300 mile round trip to represent the county. Oxford City and County provided once again a fabulous venue for the Hawker Cup semi-finals and final with four teams competing for the Hawker Cup title. Banbury Central A against Carterton A, and Headington B against West Witney were the two semi-finals. Central’s Alan Carter, Tom McKenna, Lee Young and Will Campion were up against Carterton’s Andy Wise, Steve Aldren, Robbie Clanfield and Paul Sharman. A close affair for the first half of the game before saw the score all tied at 9 shots after 10 ends. Carterton took a 17-9 lead after 13 ends before Central battled well to end the game only losing to Carterton 20-16. In Contrast the other Carterton rink, of Pete Latter, Phil Monahan, Dave Clanfield and Remy Clanfield took an early 11-1 lead after 7 ends against Central’s Graham Morbey, Malcolm Leather, Keith McNeil and Nigel Galletly. A great fight back from Central saw them only 2 shots adrift at the end of the game, losing out 20-18 to Carterton. Carterton progressed to the final winning 40-34. The other semi-final was between Headington B and West Witney. Harvey Alder, Gerald Coombs, Paul Skidmore and Kevin Alder were up against Bernie May, Alan Manger, Gary May and Howard Watts. A very tight tussle from start to finish saw neither side able to break away after 16 ends. 5 shots over the next from West Witney saw them 17-11 up before Watts’ men picked up 3 on the last losing to Alder’s men 17-14. The other Headington rink was Jon Philpott, Kalvin Woodward, Nathan Lewis and Mark Charlett up against West Witney’s Bradley Squires, David Leighfield, Will Parker and Andy McIntyre. A strong start from Charlett’s rink saw them 11-1 up after just 4 ends before West Witney kicked into gear 8 shots in the next 6 ends to see the score 12-9 after 10 ends in Headington’s favour. A strong second half saw the Headington boys command a 22 shot to 15 win over the Witney rink which compensated for their other rinks’ loss. Headington progressed to the final 36-32 winners. The third place playoff saw Banbury Central A face West Witney in the glorious afternoon sunshine. Nigel Galletly’s rink up against Kevin Alder’s rink saw a close affair with neither side able to gain a sizeable lead. The Witney rink came over the line 18 shots to 17 victors. Will Campion’s rink were up against a rearranged rink, this time skipped by David Leighfield. The Witney rink had a good first half game which saw them 20 shots to 8 up after 13 ends. 9 shots over 4 following ends saw the Witney rink take an uncatchable lead which saw them with a 30 shot to 15 win. West Witney taking third place, 48-32. The Hawker Cup final between Carterton A and Headington B saw Howards Watt’s rink up against Remy Clanfield’s side. Good quality bowling from both teams saw a tense final which saw Headington 12 shots to 10 up at 16 ends. A 4 shot pick up from Watt’s men on the 17th end gave them a 16-10 lead before Carterton battled well winning all remaining 4 ends to pip victory 17-16. The other rink saw Paul Sharman’s team against Mark Charlett’s rink. Again a high quality battle which saw the scores tied at 10 shots apiece after 12 ends before Carterton picked up 7 shots over 2 ends to go 17-10 in front. 3 strong ends from Headington saw them take 12 shots and a 24-17 lead after 18 ends. Although winning the final 3 ends, Carterton only picked up 5 shots to leave a deficit of 2 shots on their rink. Combining the rink scores saw Headington B claim the Hawker Cup title 40-39 victors. A big thank you to everyone at Oxford City and County and to all competitors who arrived so promptly and provided an excellent day for competitive bowls in the blissful sunshine. Also a huge thank you to Duncan Muir for umpiring the day. Margaret Morris of Banbury Borough BC has won the county champion of champions after beating Katherine Hawes, Oxford City and County BC in the final. 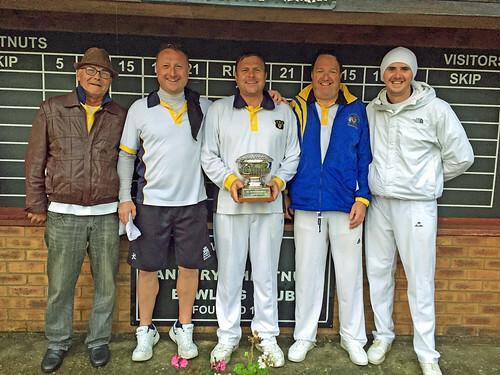 14 Club Singles Winners were in the draw for the Champion of Champions which was played in fairly good conditions until the Final when the heavens opened. The day provided excellent bowling up to and including the final which was a very closely fought game. Margaret got off to a very good start but by the 6th end Katherine had evened the score. Until the 17th end the scores were level at 13-13. With conditions getting extremely wet and the light fading Margaret picked up 4 shots on the next two ends but Katherine came back again with a 2 to make the score 15-17. By the 23rd end the score was 17-19 in Margaret’s favour then Katherine picked up a 1 to make it 18-19. The last end saw Katherine holding shot until Margaret played her last wood into the head and ran the jack to pick up the winning 2 shots. Thanks to everyone who attended, including all the markers and to all the supporters, especially those who stayed to the end but watched from inside to avoid getting wet! Oxfordshire travelled to Hewell BC on Tuesday 11th September to play their final away friendly of the 2017 season against Worcestershire Once more losing 4 rinks, this time the winning margins on the 2 winning rinks were insufficient to cover the losses on the other 4. Struggling to score shots throughout the afternoon, Alan Ley’s rink picked up a single on the last end to not only win their rink by a single shot but to raise the counties total to 100. With Worcestershire scoring 121 the overall result was clear cut, thoughts turn to the last game of the season next week at Thame and the 2018 season. Allan Smith John Timms Allan Hall Ken Williams lost 15-25. Mel Cameron Eddie Dorling Alan Wase Melvin Brain lost 17-21. Ron Slater Douglas Wright Alex Fleming John McGeough won 24-19. 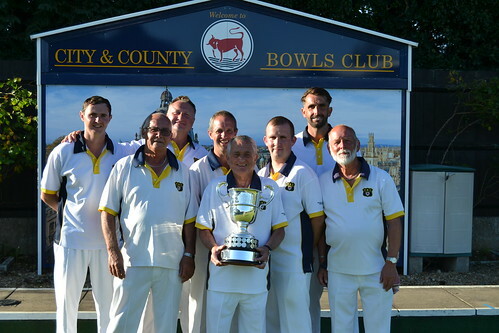 Headington A were looking to crown a record breaking season, by becoming the Oxfordshire Bowls League Cup champions for the fourth year in a row. Having celebrated reaching the final for the first time, their opponents Witney Town brought plenty of support to cheer their team on. With the floodlights warming up ready to brighten up the Kidlington green, the stage was all set. Unfortunately for the Witney challengers it was already looking ominous after the first 3 ends, as the League Champions got quickly into their stride. By the half way point Headington A had already amassed an unassailable lead, with only Witney Town’s President, Alan Scholan, ahead on his rink. By 15 ends all four Headington rinks were comfortably in front and the defending Champions continued their good form and marched on to victory – remaining unbeaten in the League and Cup for the whole season. Ray Gaskins skipped the highest winning rink for Headington, with Mick Nash, Norman Rae, and Colin Whitehead completing the four. Headington A 94; Witney Town 45: H Watts 18, A Scholan 15; R gaskins 31, B Bloomfield 7; J King 26, P Demczak; M Charlett 19, T Ludlow 9. Another disappointing league result and the last match of the season with only two winning rinks against Cambridgeshire.